This version of our 2 point restraint harness kit (adjustable web lanyard) benefits from the addition of an adjustable webbing lanyard, giving users more flexibility when attaching to an anchor point. With a comfort harness and inclusive kit bag, it is a feature-packed option for safe working. 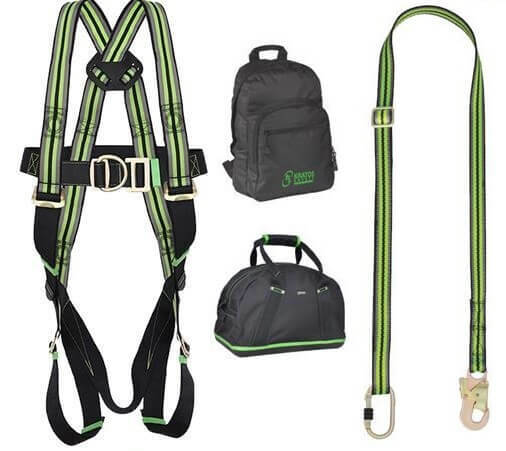 This kit provides a great all-purpose platform for working at height, as the harness can be adjusted so that the thigh and shoulder straps are suitable for any user. The 2 points of restraint come in the form of the D-ring attachments which can be found on the front and rear of the harness. We also offer single point restraint kits if the work you have in mind does not require this type of fall arrest setup. If you are willing to spend a little more, our 2 point premium kit has a luxury harness as part of the deal. The adjustable webbing lanyard can altered so that its length is anywhere between 1.4 and 2 metres. A sturdy alloy ring handles the adjustment and can withstand plenty of force, so should be strong enough to stay in one piece throughout the life of the kit. One end of the lanyard is topped off with a steel snap hook, while the other comes with a karabiner, as you would expect from this type of product. Having Trouble Finding the right Height Safety Gear? Talk to the specialists at Rope Services direct and all of your height safety equipment questions will be answered. You can either phone us on 01384 78004 or email your query via our contact page. 2 Point Restraint Harness Kit (adjustable web lanyard) Overall rating: 5 out of 5 based on 6 reviews.